I hate rust. All greenhouse managers hate rust. Rust is the enemy, the relentless destroyer of greenhouses. 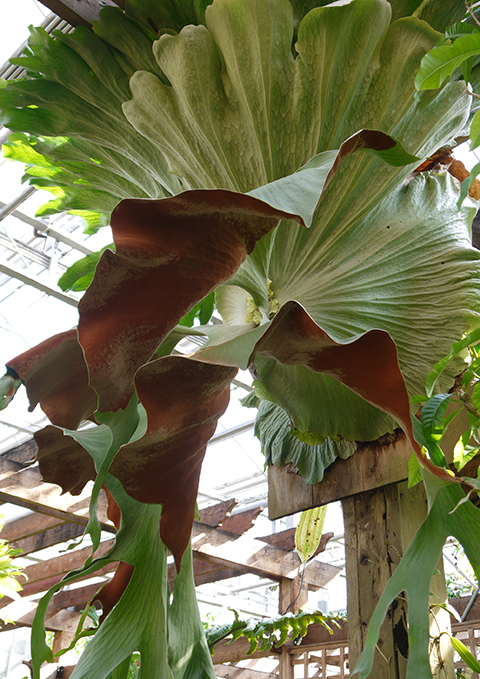 It was Sarah Carter of our staff who drew my attention to the magnificent staghorn ferns directly above the sculpture. The thick carpet of rusty spore patches on the underside of the fronds matches the sculpture perfectly in color and texture. 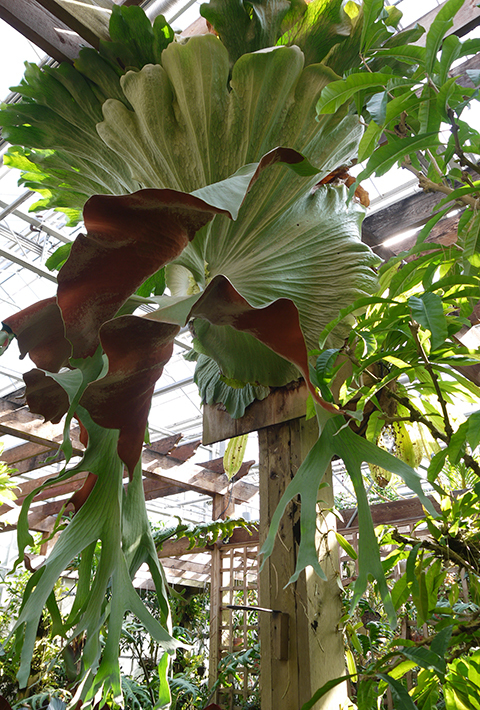 Staghorn ferns, like our Platycerium wandae, produce two different types of leaves: clasping shield fronds that surround the root ball and attach the young sporling to a vertical surface; and the staghorn-like fertile fronds which develop spore patches when mature. Our staghorns produce a tremendous quantity of rust colored spores that germinate readily on the cedar pergola. Ferrugineous (ferrum = iron) is the Latin adjective for rust colored. Staghorn ferns aren't the only example of ferrugineous surfaces in nature. 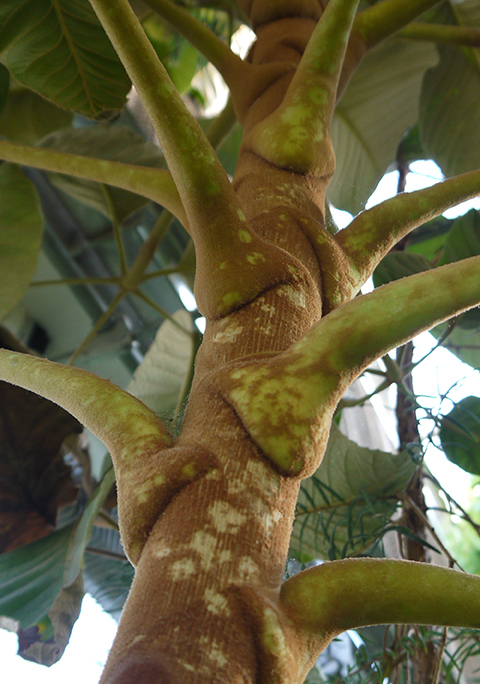 Schefflera macrophylla from south China & Vietnam wears a velvet mantle of rusty hairs on its stem and petioles. 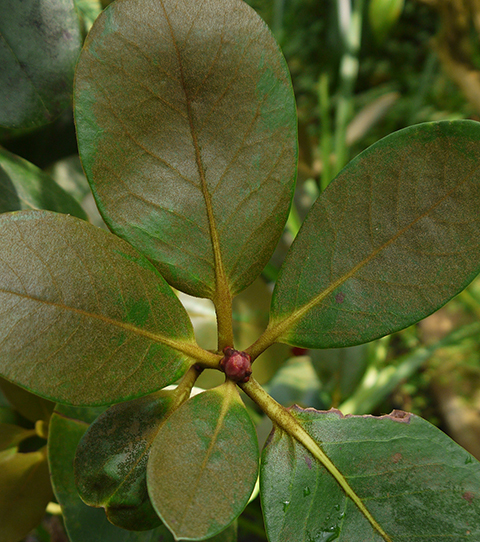 Rhododendron konori, one of the Vireya Rhododendrons in the Tropical High Elevation House, produces leaves and buds covered with an attractive dusting of rusty scales (which are multicellular epidermal hairs). 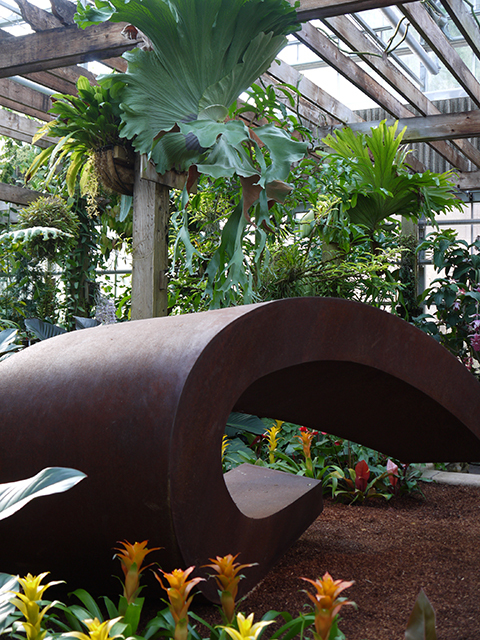 Horizontal Twist, with its lovely patina of rust, looks entirely at home among these plants. Who would have imagined that rust could be so beautiful?